You may know the type of life insurance you need, but how do you know how much coverage is best? 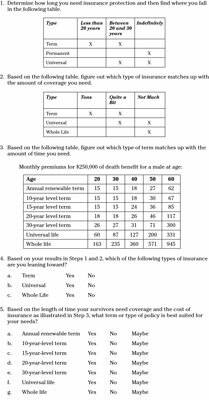 To calculate how much life insurance you may need to support your surviving family, check out the Calculating Your Life Insurance Needs worksheet, included here, to calculate your personal life insurance needs. Complete the worksheet for both you and your spouse or partner to determine both of your life insurance needs. 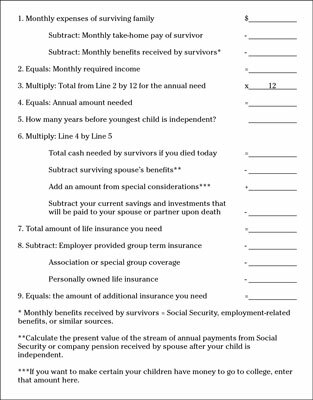 Click here to download and print the Calculating Your Life Insurance Needs Worksheet. If you’re relatively healthy, term insurance is quite affordable, so if in doubt about the appropriate amount of life insurance you need or for how long, buy as much coverage as you can afford. You can generally drop a portion of your coverage as time passes. If you have a partner and one of you doesn’t work outside the home, be sure to add to the monthly expenses of the surviving family the cost to replace the stay-at-home partner’s financial contributions to the household. For example, if a stay-at-home parent dies when your children are still young, you might need to hire a live-in nanny so that your children are well cared for and you can continue to work outside the home as you have been. To hire the services of a full-time nanny, you might need to spend $25,000 to $40,000 a year for as long as you need this level of service. Add this cost to the monthly expenses of the surviving family on line 1 of the worksheet. By calculating your life insurance needs, you can rest assured that your family will be adequately cared for if you die suddenly. Calculating your needs also prepares you for discussions with life insurance agents or companies so you buy just the right amount of coverage you need — no more, no less. Use the Which Type of Insurance Is Right for You Worksheet to determine which option will be best for you, now that you know how much you need. Click here to download and print the Which Type of Insurance Is Right for You Worksheet. Say, for example, that your family needs a total of $800,000 in life insurance now if you were to die, and you want to keep $200,000 worth of coverage for your spouse when he or she reaches age 65 in 30 years. You’d like your spouse to have that coverage for the rest of his or her life. You should then obtain a total of $600,000 in term insurance — preferably 30-year level term coverage or a 20-year level term policy that is guaranteed renewable. Then purchase a separate universal life policy to provide $200,000 for your spouse that lasts until he or she is age 95 or stops paying premiums and depletes the cash value.